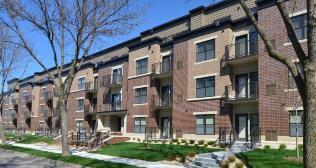 Station 38 Apartments in Minneapolis has all of the offerings for your perfect home. Located just steps from the 38th Street Light Rail Transit Station, you are minutes from not only what Downtown Minneapolis has to offer with great restaurants, shopping and live music and sports, but also to the Mall of America and MSP Airport. Enjoy easy access to Minneapolis’s renowned bike trails, including the Midtown Greenway, Minnehaha Park and the Mississippi River Road. Each of Station 38’s apartments has a carefully designed floor plan, complete with full-size washers and dryers, contemporary kitchens with stainless steel appliances and ceramic tile baths. These homes have a balcony, patio, or front stoop for a private outdoor retreat and a select few have spectacular views of the Minneapolis skyline.